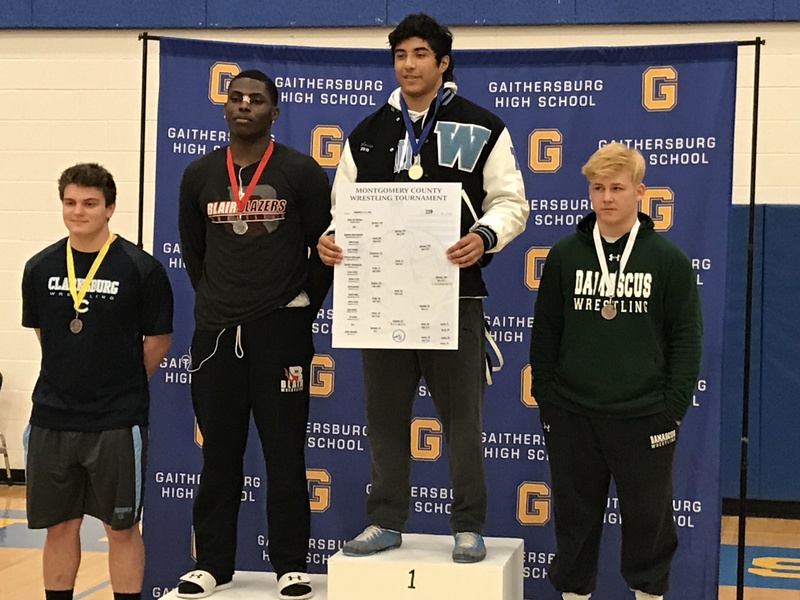 The Montgomery County Varsity Tournament was held on Friday February 16th and Saturday the 17th at Gaithersburg High School. Twenty-five teams were present at this year’s tournament where the Vikings entered 10 varsity wrestlers. Whitman did not have wrestlers represented in four weight classes which were 106, 113, 126 and the 182 brackets, with some being missed due to injuries. The tournament started off with a familiar tune as the 300 Violin Orchestra was played over the loudspeakers (the same song Whitman makes their entrance to at every home meet). This must have brought the team good luck as Whitman placed five grapplers in the coveted top six spots of their respective brackets. These six top finishers are guaranteed to advance to the Regional Tournament next weekend in Clarksburg. · Clark Boinis at 132 was 2nd. Clark had a great tournament going 3-1 and won his first three matches to advance to the championship round. Clark’s victorious semi-final match was against a senior Damascus wrestler who was ranked #1 in the 132 pound weight class for the entire season. Although Clark lost in the finals he did bring home a second place finish that would vault him into the top seed in the upcoming Regional Tournament. · Max Gersch at 145 was 5th. Despite being seeded 13th Max was able to wrestle his way into the Regional Tournament. Max had perhaps the biggest upset of tournament with his first round win over the 4th seed from Sherwood. 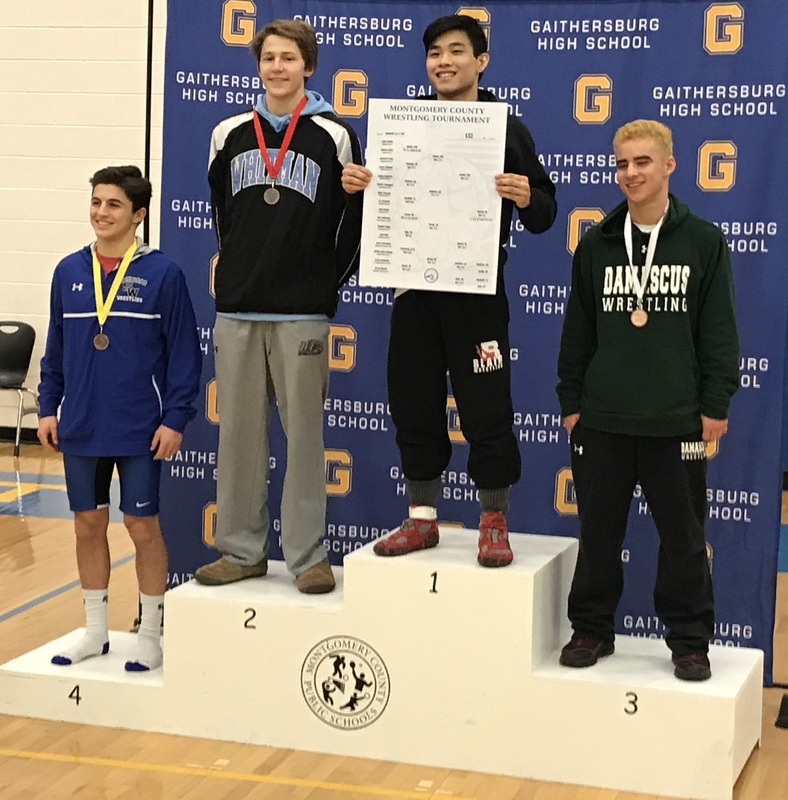 Max went on to finish 4-1 at the tournament to secure his visit to Clarksburg. · John Mackall at 160 was 6th. John went 3-2 at the tournament with 2 of his wins by pin. John the was sixth seed in his very competitive weight bracket and finished as such. · Yussef Zaki at 195 was 4th. Yussef wrestled very tough throughout the tournament and went 1-2. Both of Yussef’s losses were by the closest margin of one point each. Yussef’s body of work earned him a second place seeding at the Regionals next week. · John Luke Iglesias at 220 was1st. John Luke once again proved why he is the reigning Montogomery County Champion. John beat a talented wrester from Blair in the finals by 10-3 to secure his second consecutive county title. John Luke will now go into the Regional Tournament with the number one seed and defend his Regional title from last year. Well done John Luke! Those not finishing in the top six spots but who still qualify for Regionals based on their accumulated season point totals are Peyton Casamento at 120, Sebastian Turkewitz at 170 and Tom Wilmarth at 285. Congratulations to all eight of our grapplers who are advancing to Regionals. Good luck to all and let’s bring home some more top finishes!